If you get bored of your Mac desktop image, it might be time to change it to a new image. There are a few different ways to change a background on a Mac, and this guide will share the most popular ones with you. We will show you how to change a background on Mac in Finder, Photos, and System Preferences. This method for changing your Mac background uses the basic Finder feature found on all Macs. Click the Finder icon to open up a Finder window on your Mac. Find the file that contains the image you want to use as your new background. Right-click or control-click the picture to bring up a list of options. Choose the “Set Desktop Picture” choice found at the bottom of the set of file options. Go back to your desktop to confirm that you correctly changed your background. This process will only change the wallpaper for your primary display. If you have multiple displays, you can change your background in the Photos app to set a new desktop image for any specific display. 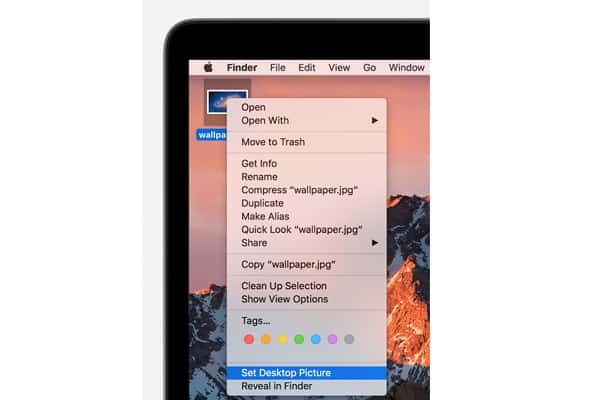 Open the Photos app on your Mac computer. Drag the window until it is located on the monitor display that you want the new background to appear on. Locate the image that you would like to set as your new background. Control-click or right-click on the picture to view a set of options. Choose the “Share” option to reveal a secondary menu. Click the “Set Desktop Picture” choice to change your background. The final method for changing your background is to alter it by entering the desktop Preferences area on your Mac. Click the Apple icon to reveal your basic computer menu. Select the “System Preferences” area from your menu. Go to the “Desktop and Screen Saver” part of the menu. Add the folder that contains your desired image, if necessary, by clicking on the plus icon. Pick a folder of images from the list on the left to view each picture in the folder. Click an image from the list of pictures that will show up on the right. Once these steps are done, you can enjoy a brand new background image. Keep in mind that all background pictures must be in the PNG, JPEG, PICT, or TIFF format. If you encounter any other issues, get in touch with Apple Support for help.